Over the course of twenty years, the Library Company of Philadelphia published nearly sixty online exhibitions, its first being Ardent Spirits in 1999. What started as simply a way to share a short-lived gallery exhibition more broadly later evolved into a key marketing piece of the exhibition lifecycle. Today, online exhibitions are brought into the fold of all that is digital in the library. 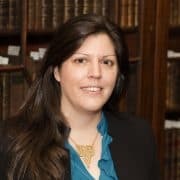 An ecosystem of digital life has emerged with most collection items featured in an online exhibition being linked to subject guides, blog posts, social media, and the digital asset repository. In July of 1997, I was fresh out of college and hired as the library assistant at the Library Company of Philadelphia. The library’s web presence consisted of a single web page hosted for free by a local Philadelphia company called LibertyNet.org. The only person on staff that knew how to edit the page left for a new position within the first six months I arrived. Although I had no HTML experience, I had been fortunate enough to have attended a high school that saw great value in computer science education, beginning MS-DOS lessons as early as seventh grade. My high school received a grant when I was a freshman that allowed the art department to build a computer graphic design lab in 1989. With two black and white scanners and the first release of Photoshop, along with Illustrator and other software, our art teacher heroically taught 9-12th graders how to use tools most college students had not yet gained access to. By my senior year I had the design bug and had hoped to continue my education and become a graphic designer. Unfortunately, I could not find a school with such a program. I was offered majors in either computer science or fine art but no computer graphics, so I settled on my other passion – History. By my junior year of college there was one “digital art” class finally available that I took to complete the arts requirement for my History BA. Flash forward to early 1998, I shared this design experience with my supervisor and asked if I could purchase a beginner’s guide to HTML and learn how to manage the website. 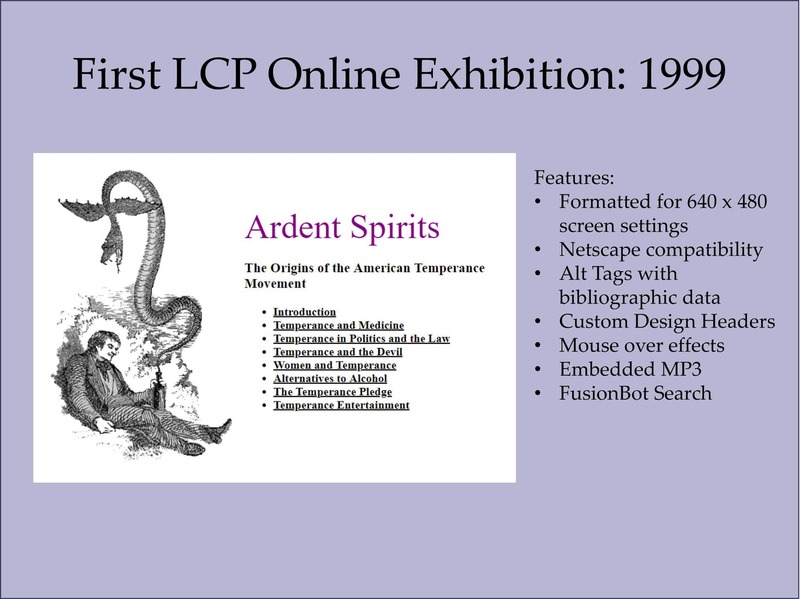 Within a year, I had redesigned the organizational site and began designing our first online exhibition Ardent Spirits. This began a long journey of self-education through books and trial and error combined with a few classes as they became available. By 2009 I had built a portfolio of twenty-seven online exhibitions. In 2010 I was given the opportunity to attend Moore College of Art & Design and earn the Digital Arts for Print & Web Certificate. 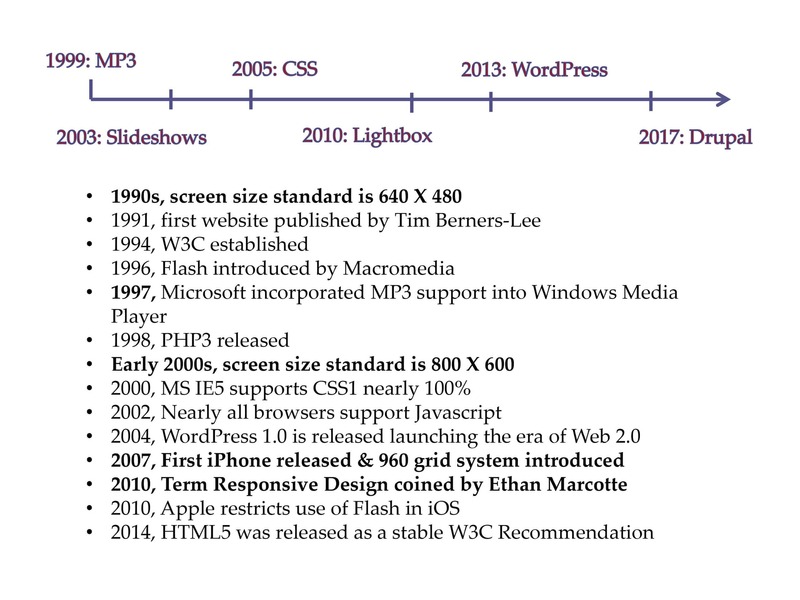 This was a perfect time to receive formal training in website design as the 960 grid system was finally established as a design methodology, the concept of responsive design was emerging, and user experience design through the use of personas was trending. Online exhibitions are the Library Company’s historical record of how web design, accessibility, digitization, content management, and user experience have changed over the last two decades. As we look towards the future, we must consider the implications of both changes in technology and user expectations. Fundamental issues surrounding preservation, sustainability, and emulation must be strategically planned for both new and existing resources. Creative methods of measuring impact, beyond standard web analytics, need to be devised showing a return on investment to guarantee continued funding. This was the theme of a presentation Ann McShane, Digital Collections Archivist, and I made at the November 2018 Upper Mid-West Digital Collections Conference. Click here to view my slides which reflect the technological milestones of the Library Company’s online exhibitions. Over the next twelve months we will be featuring our collection of online exhibitions on social media and in our digital newsletter as we celebrate 20 Years of Online Exhibitions!